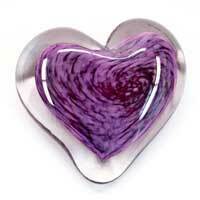 Colorful solid glass heart paperweight from blown glass. 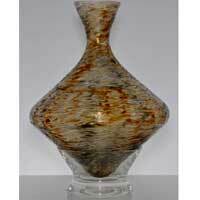 Asymmetrical Wine Decanter makes a unique wedding gift, anniversary gift, or retirement gift. 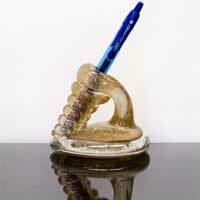 Beautiful fine glass pen holder makes a unique desk accessory and also appreciated as a work of art. 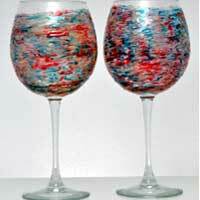 These Wine Glasses are reproducible. 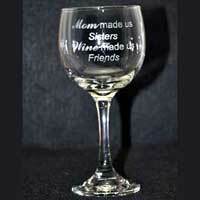 But because the glass art is handmade, each piece will be different and unique to it’s own creation. 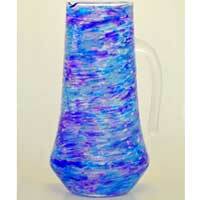 This Vase is reproducible. 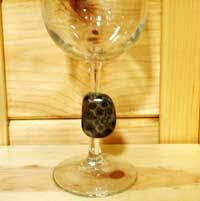 But because the glass art is handmade, each piece will be different and unique to it’s own creation. 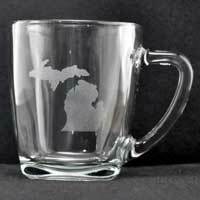 This Laser Engraved Glass Mug is laser engraved with choice of Michigan design or Michigan’s Great Lakes design and optional ¹personalized engraving. 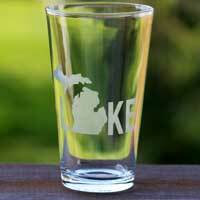 Laser engraved stemless glass with your choice of personalized engraving. 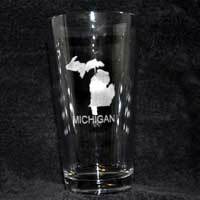 Michigan laser engraved beverage glasses with your choice of Michigan map design or Great Lakes of Michigan design and optional ¹personalized engraving. 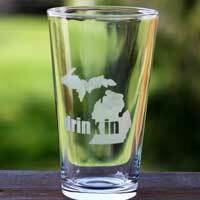 Enjoy your favorite cold beverage with this laser engraved Michigan glass, sure to be your favorite! 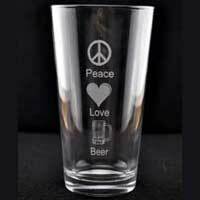 Laser engraved beer glass with “Peace Love Beer” icons and text and optional ¹personalized engraving. 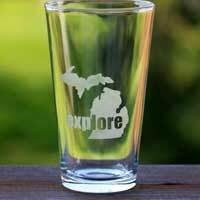 Enjoy your favorite beer with this laser engraved beer glass. 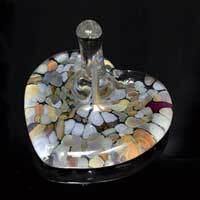 Heart shaped blown glass ring holders in a variety of colors. 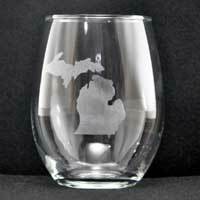 Laser Engraved Red Wine glass with personalized engraving. 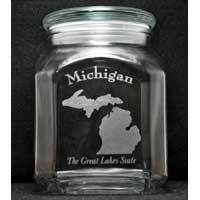 This Michigan Engraved Candy Jar or Treat Jar with glass lid is laser engraved with choice of Michigan design, Great Lakes design, Hooked On You design, and optional ¹personalized engraving. Custom engraved Candy Jar also available. 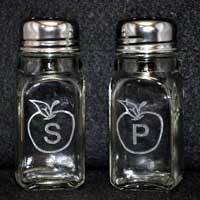 Laser engraved glass Salt & Pepper Shakers with your choice of engraving. 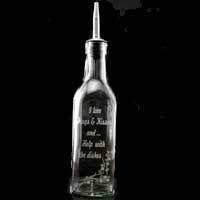 Laser engraved dish soap dispenser. 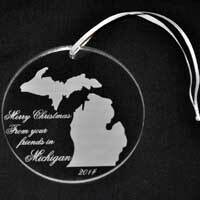 Personalized Acrylic Ornaments in a variety of designs. 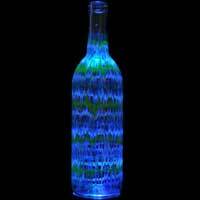 This Wine Bottle is reproducible. 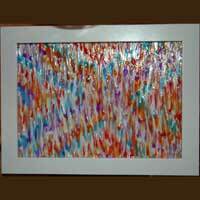 But because the glass art is handmade, each piece will be different and unique to it’s own creation. This Window Panel is reproducible. 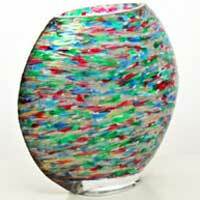 But because the glass art is handmade, each piece will be different and unique to it’s own creation.